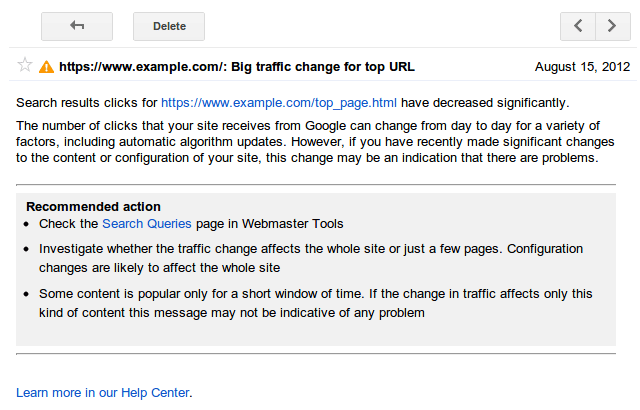 Google announced on the Webmaster Central blog that they added a new notification to Google Webmaster Tools message center. The new notification informs you of big changes in traffic from Google due to search query changes. The new alerts are Search Queries Alerts that will notify you have major changes in your search queries to your sites. I.e. major changes in impressions and/or clicks (often related). Some of these changes may be expected and some may not be (i.e. technical issues). Note, these alerts look very similar to the Big traffic change for top URL alerts we posted about in May of this year. The difference here is that these are specific to search queries and the others seem to be more general in nature. Or maybe that was just a test and this is the real deal now? Forum discussion at Google+ (the man who made this feature).